Have you all been to IKEA lately? We both went this week to scout out some of our favorite things and we found so much goodness. We've rounded up our 15 favorites from dress ups to toys and furnishings. LATTJO brain, bug and snail hats: these hats beg to be worn. The brain hat may be my favorite, but the bug and snail are so good as well. They also have a bat and wig in this line that deserve some attention. Prices range from $6.99 to $9.99. 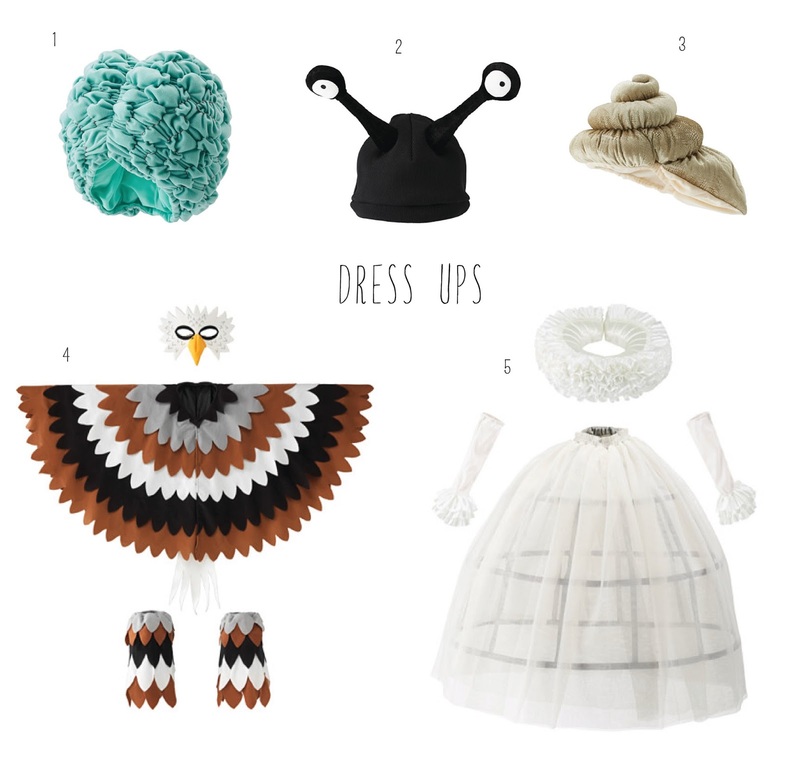 LATTJO eagle and queen costumes: this queen costume is awesome, the crinoline and ruff plus gloves make us wish it came in adult sizes as well. As for the eagle, the details are spot on, how about those tail feathers and the feathered leg warmers topped off by the mask. IKEA is seriously killing it here. Pricing is $26.97 for the eagle and $36.97 for the queen. 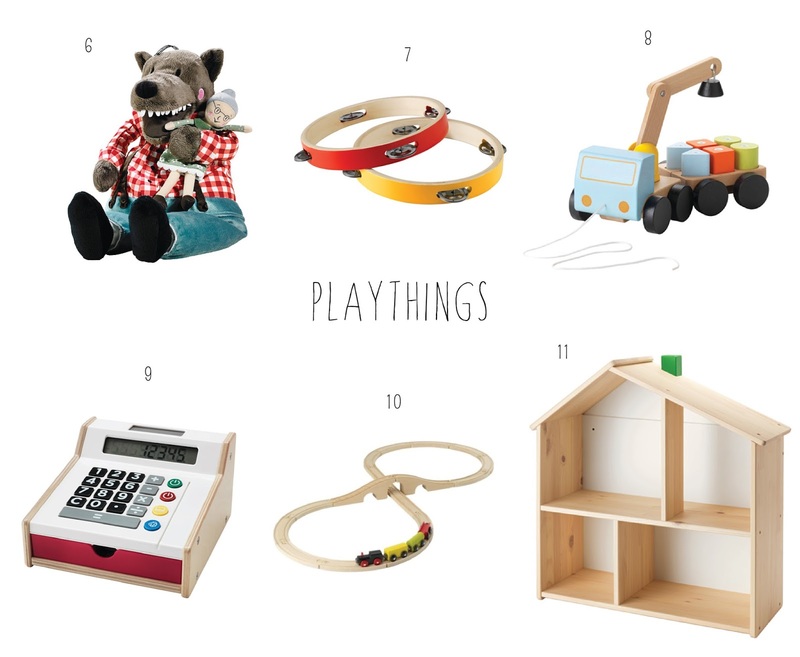 LUFSIG Big Bad Wolf: This wolf is one of our favorite IKEA purchases. It comes as a set; that little grandmother you see the wolf cuddling actually comes stuffed inside its mouth. You can pluck the grandmother out of the the wolf's mouth or shove it down into his belly again as you act out fairy tales. Priced at $9.99. For those of you that are fond of the Three Little Pigs IKEA also has some cute piglets. LILLABO Train Set: If your child is completely enamored with trains, we understand taking the plunge with Thomas the Train. However, if your kids have a more casual interest, this 20 piece train set is a great option. Four basic train cars, curved and straight tracks, and a bridge you can go over and under. IKEA actually has a whole LILLABO series, so you can get add-on tracks and trains, and other types of vehicles. It also connects with other sets, like Janod. Priced at $9.99. FLISAT children's table: Have you ever spent hours searching for a modern play table that is not hundreds of dollars? We have and it is quite the task that generally ends in disappointment. So imagine our excitement when we spotted this play table. The top white panels can be combined with TROFAST drawers so that projects and supplies can quickly and easily be stowed away and revisited later. Priced at $49.99. FLISAT children's stool: It is also surprisingly hard to find a simple clean lined stool that doesn't run upwards of a $100. 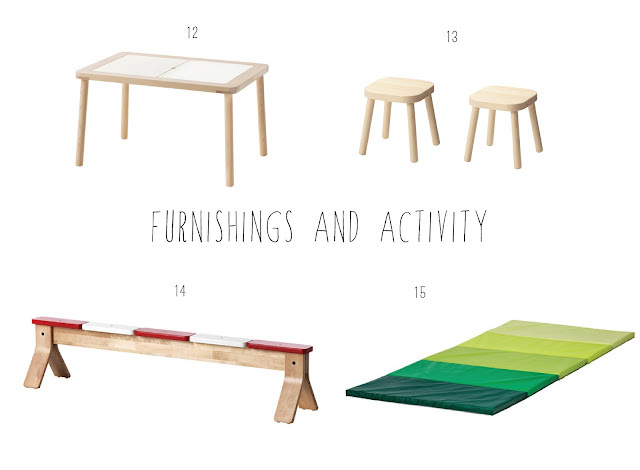 IKEA pairs these stools with the children's table, but really they would work well with a myriad of applications. Priced at $19.99 each. IKEA PS 2014 balance beam: This balance beam is a fantastic addition to any play space. Use it as indoor training for a budding gymnast, part of an obstacle course, a platform for a jousting contest, or a bridge to fish from. The possibilities are endless. Priced at $59.99. IKEA PLUFSIG folding gym mat: Dancing, handstands, tumbling, breaking falls. This mat is a great way to designate a temporary space for almost any indoor activity. If your kids are anything like ours, a little extra padding is always welcome. Folds easily for convenient storage. Priced at $34.99. We told you it would be good, do you have a new IKEA favorite? Or perhaps on old one?